So the intention is clearly stated. "BACKSTOP REQUIREMENT— if the final rule [not later than January 1, 2017] does not produce savings that are greater than or equal to the savings from a minimum efficacy standard of 45 lumens per watt, effective beginning January 1, 2020, the Secretary shall prohibit the sale of any general service lamp that does not meet a minimum efficacy standard of 45 lumens per watt"
"may qualify as an outright “ban” on certain general service lamps"
essentially requiring general service bulbs to be as efficient as today's CFLs"
Federal US (like EU) regulations are not just about banning simple regular incandescent light bulbs, they are also about banning incandescent technology itself for ordinary common light bulbs. 1. Setting a standard that does not allow certain products is of course the same as banning them. 2. 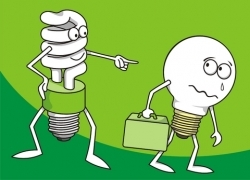 Setting energy efficiency standards that (by 2020) does not allow any of today's known or indeed announced ordinary incandescent bulbs - including the Halogens that are usually around 20 lumen per watt, maxing at around 25-30 lumen per watt - is the same as banning them too. The pro-regulation propaganda machine is being rolled out to reassure American consumers - and their political representatives - that the popular light bulbs (8 out of 10 bought) won't go away, that they will still have "lookalike alternatives". This has recently taken a new frenzy, following the launch of Congressman Joe Barton's repeal ban bill for a vote next week. "Supporters of the repeal falsely claim that lighting efficiency standards will ban incandescent light bulbs. But as Rep. Upton knows well, this is claim is simply untrue. Indeed, it’s a whopper. Advanced incandescent bulbs that meet the new efficiency standards – but look and provide light just the same as old-fashioned light bulbs -- are on the market..."
This is therefore not true, standards will be phased in for regular general service household bulbs that no known incandescent - Halogen or otherwise - can meet, and even if they could, they would hardly be made, as incandescent technology is admitted to be unprofitable for the major manufacturers (the industrial politics is covered here). is that energy standard requirements change product characteristics. See http://ceolas.net/#cc21x regarding buildings and cars as well as washing machines, TV sets etc apart from light bulbs. So, for example, a fuel efficient car may be lighter, flimsier, less safe, or slower and more poorly accelerating then the equivalent without fuel efficiency standard. If people really take up this "offer" to keep using incandescents that are less energy efficient than CFLs or LEDs the national energy savings would be even less than otherwise. The temporarily allowed Halogen type replacements are only available in certain shops - and then only in in limited ranges - following the same bland promises from politicians there. CFL and to a lesser extent LED sales are massively pushed in general stores, "to save people money", regardless of whether people like them or not (and liking a product does not mean one still can't appreciate other products, for their advantages). - and that also in transparent bulbs finds attractive uses that frosted CFLs and LEDs find impossible to emulate, among many other incandescent advantages. Note thereby the particular irony that 100W bulbs are the first to be banned, with their simply and easily constructed bright omnidirectional performance, and indeed a warmth that in most temperate climates is another advantage (a heat effect ridiculed by government spokesmen until they talk about it's "bad effect" on air conditioning cooling - political logic, if you will). energy savings are the main reason for energy usage standards. The supposed amount of energy savings are in fact not there, and even if they were, there are much better and more relevant energy savings in electricity generation and distribution as well as consumption. Given that the need to save electricity for paying consumers can be questioned in the first place, there is nothing to defend these federal regulations. is that consumers as a whole will hardly save money – regardless of what the energy savings are. That is not just in having to pay more for the light bulbs as an initial cost (or being forced to pay for them, via taxpayer CFL programs), but also because electricity companies are being subsidised or allowed to raise rates to compensate for any reduced electricity use, as already seen both federally and in California, Ohio etc, and before them in the UK and other European countries. So.... what's the problem here? You want low grade light bulbs to continue? good points though not surprised politicans co-operate with business rather than think of what consumers want! Since when did CHOICE come before PROFIT anyway? So we still get to buy the Mercury bulbs. Great. Tyrrell... I want choice to continue! ...banning all the "New" supposedly allowed incandescents. With all those debates of the government of whats best, I hope they still give the people the power to choice of whats best for them. After all, it is the mass people decision and money to buy not them. LED light bulbs could very well be the next best thing in lighting. The technology is making inroads in every market, with an LED bulb for any application. LEDs have a long list of advantages over incandescent and CFL lighting. A common complaint about compact fluorescents is the ramp-up time to full brightness. Instant-on CFLs provide light instantly, but still require time to reach full brightness. LED light bulbs provide full illumination from the moment they’re turned on. It reminds me of how compact fluorescent technology slowly dominated incandescent technology. There is a similar roadblock, as well; LEDs have outlandish high prices. and the token energy saving ban of simple safe incandescent lighting would therefore be wrong regardless of what CFLs or LEDs or any other lighting can offer. What authority does the federal government have to ban any lightbulb, regardless of how inefficient it may be? Since when is it required that the federal government impose its will over the choice of the people? Who cares which light is better!?!?! First ask if this is something the federal government is allowed to regulate. Too many stupid Americans get cought in the false premise of assuming the government can do it and skip right to debating whether the government should do it. NO! NO! NO! You allow the government to do your thinking for you and you submit to tyranny people. Wake the hell up! Let those of us who ejnoy incandescents to choose them. Those of us who want to buy something else should be free to choose that as well. Since when do we have to have a federal government remove an option? Regarding LED's - they are just becomed a competitive concurent. Check the CXA-2011 LED made by Cree - it's as bright as a 200W halogen bulb, consuming 45W - still require a heatsink, but IS CHEAP, only 15 Euro!